Norfolk Tours has appeared in print and on various radio shows over the years and some of the articles are reproduced or linked below. I regularly write for both local and international publications, about local and family history as well as articles on the attractions for holiday-makers in the Eastern Counties. Glynn Burrows could be described as a family history “fixer”, the sort of person you might see on the popular BBC TV programme Who Do You Think You Are? taking the celebrity in question to a particular church or house that was relevant to their ancestors. Although, in such programmes, crucial branches of the family tree are stumbled upon as if by chance by the celebrities, of course there will already have been months of work behind the scenes by historical experts piecing together the information so that the star can “discover” it on screen. Anyone who has delved into their own family history will know how addictive that research can become – but also how it is being able to visualise the people and places that have been important to your ancestors that really helps to bring all the months and years of careful study to life. And that is where Glynn comes in with his Gressenhall-based company, Norfolk Tours. He explains: “I am Norfolk born and bred – if you cut me in half, you would find “Norfolk” running through me! “I became interested in family history in 1977 and gradually discovered that my mother’s family had been in Weasenham since 1620. As I researched further I found that all my relations came from Norfolk – except a couple who had crossed the border into Suffolk. Norfolk has, of course, many connections for American visitors particularly – from Hingham’s links with Abraham Lincoln’s family to Pocahontas at Heacham. Glynn has helped to highlight the county’s heritage to USA listeners to an internet radio show broadcast from California, as the show’s “Man on the spot in England”, talking about our traditions and what is available for visitors to this beautiful area. 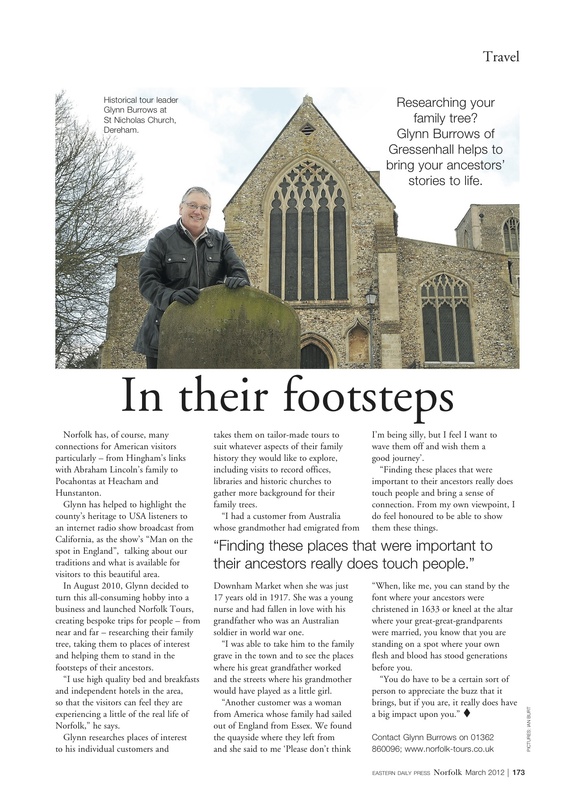 In August 2010, Glynn decided to turn this all-consuming hobby into a business and launched Norfolk-Tours, creating bespoke trips for people – from near and far – researching their family tree, taking them to places of interest and helping them to stand in the footsteps of their ancestors. “I use high quality bed and breakfasts and independent hotels in the area, so that the visitors can feel they are experiencing a little of the real life of Norfolk,” he says. 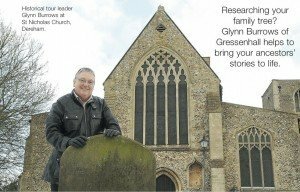 Glynn researches places of interest to his individual customers and takes them on tailor-made tours to suit whatever aspects of their family history they would like to explore, including visits to record offices, libraries and historic churches to gather more background for their family trees. “Finding these places that were important to their ancestors really does touch people and bring a sense of connection. From my own viewpoint, I do feel honoured to be able to show them these things. “I had a customer from Australia whose grandmother had emigrated from Downham Market when she was just 17 years old in 1917. She was a young nurse and had fallen in love with his grandfather who was an Australian soldier in world war one. “I was able to take him to the family grave in the town and to see the places where his great grandfather worked and the streets where his grandmother would have played as a little girl. “Another customer was a woman from America whose family had sailed out of England from Suffolk. We found the quayside where they left from and she said to me ‘Please don’t think I’m being silly, but I feel I want to wave them off and wish them a good journey’. “When, like me, you can stand by the font where your ancestors were christened in 1623 or kneel at the altar where your great-great-grandparents were married, you know that you are standing on a spot where your own flesh and blood has stood generations before you.